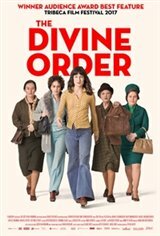 THE DIVINE ORDER is the story of Nora, an agreeably submissive and seemingly unremarkable young housewife living in a small village in Switzerland in 1971, as the rest of the world is changing and women there still don't have the right to vote. After Nora experiences unfamiliar stirrings of dissatisfaction with her place in society, she begins to stand up to the closed minded townsfolk of both sexes in her village. Despite obstacles and backlash (and some amusing sequences including one with a guru who has Nora and her compatriots use a mirror in an unusual way) Nora becomes a hero as she overthrows the status quo.